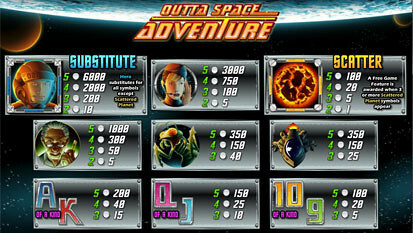 Outta Space Adventure Slots is a well-designed video slots game with 5 reels and 25 paylines. It welcomes you to the breath-taking world of spacecrafts, planets and stars. Featured graphics, free spins and a bonus mode make this game not only a good opportunity to win money, but also an exciting adventure. 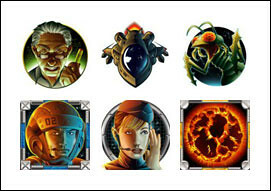 Cryptologic developers released Outta Space Adventure in April, 2008, so many people all over the world have already tried this amazing game. It is popular also due to the possibility to play with the no download flash version of the game. You are suggested to help the pilots of battle spaceships and defend the Earth endangered by the aliens. For fighting the enemy well you are payed good money. For instance, it is possible to win the top jackpot of 6,000 coins or $30,000. Anyway, you can win not only this huge prize, but also many other minor yet serious sums. In Outta Space Adventure one can try and strike up to 27 winning combinations appearing on the reels. If this is not enough and you like to ask for more, this slots machine suggests you to try a Free Spins Bonus Game and 4 great Progressive Jackpot Games. Nice-looking game design and animated symbols make the game really interesting. You certainly will not get bored while playing this fantastic slots. Special game sounds and music also make it lively and merry to help you enjoy every little moment of the game. To help the spacemen protect our planet along with winning good money you are suggested to match the following symbols appearing on the screen: Hero, Dispatcher, fast Spacecraft, dangerous Alien, Scientist, Star. These featured icons appear on the reels mixed with the regular yet helpful card symbols: Nine, Ten, Jack, Queen, King and Ace. In this game both risky high-rollers and more careful players will find what they are looking for. 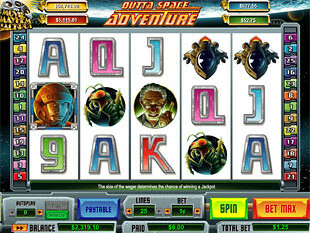 A great bets choice in Outta Space Adventure is one of the options, which will meet even the strictest demands. You are suggested to play with the following bet sizes:$0.01, $0.02, $0.03, $0.04, $0.05, $0.10, $0.15, $0.20, $0.25, $0.50, $0.75, and the more risky $1, $2, $3, $4, $5. If you are a careful player, or a fan of long games with small stakes, you are suggested to make minimal bets varying between $0.01 and $0.25. The size of minimal bet depends on the number of paylines you choose to play with. The developers took care of risky gamblers, too. The high-rollers can bet the top of $125, and try to win really big sums. Also, it is possible to use the Bet Max button to make the game with big stakes a lot easier. The highest jackpot is 6,000 coins or $30,000 for 5 Hero wild symbols. The second jackpot is 3,000 coins or $15,000 for 5 Dispatcher symbols. The third highest jackpot is 2,000 coins or $10,000 for 4 Hero symbols. In this game you can also match good combinations with the wild symbol of Hero. It substitutes for any symbol you miss to make a good winning line. Only scatter icons of Star can not be substituted, like in most slots games. Wild symbols can appear on any of the reels in this game. You can also raise good money even if none of the possible combinations appears on the reels. This can be done when two or more scatter symbols of Star appear on the screen. These icons match not depending on their place on the reels. If you hit 2, 3, 4 or 5 scatter Stars your total bet gets multiplied by 1, 5, 20 and 100, respectively. You can win a really good number of coins once the scatter icon appears on the screen. When 3 or more Star scatter icons are hit you are awarded a bonus game played on the reels. In this game you get Free Spins in order to win some money more. The free spins are played with the sum of you last bet. Free Spins. In Outta Space Adventure slots if you strike 3 or more Star scatter symbols you are awarded 20 free spins to raise some good money without doing anything. You will admire this game if you like the process of spinning itself. The free spins feature can be retriggered. It is also interesting that all your wins during the free spins games are doubled. This is a part of Movie Mayhem games network, which provides you an opportunity to win 4 progressive jackpots. The huge prizes grow all the time right on your screen, and you can win them in a special bonus game awarded randomly. Anyway, on can increase his or her chances for winning the Movie Mayhem feature by staking more coins. In the bonus mode you are suggested to pick 6 different items giving you interesting awards. 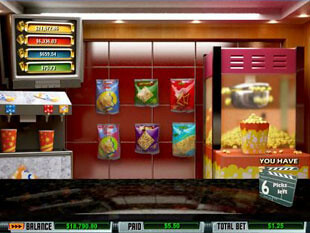 Movie Mayhem progressive jackpots can be activated only in the Real Money mode. 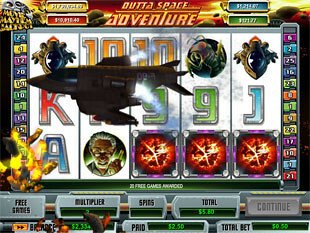 Outta Space Adventure slot machine provides you a good opportunity to try your luck and win good sums. This game featuring free spins, 4 progressive jackpots and many other winning features is a good choice for the gamblers who like to win not only on the reels, but in bonus games, too. Wide bets range, as well as nice featured graphics and sounds make the process interesting, breath-taking and very lively, so you will really like playing this game.